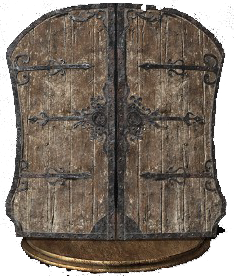 Great Shields are a class of Shields in Dark Souls 3. 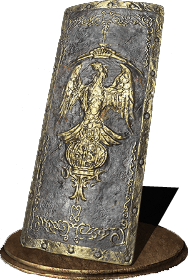 These types of Shields usually weigh a decent amount and provide the best protection in the game. They are often used by players who have high Strength, as they require a good amount to use. Dropped by Bonewheel Skeletons in Catacombs of Carthus and Smouldering Lake. Dropped by Eygon of Carim. Looted from Eygon of Carim's corpse late-game in the old cell of Irina of Carim. Dropped by Lothric Knights wielding this Shield. 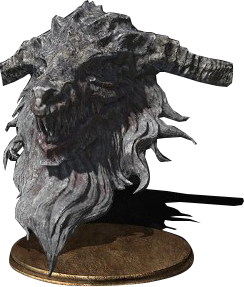 Sold by Greirat for 5000 souls (after sending him to scavenge at Irithyll Valley). Looted from a corpse on an alter near the first short cut at Cathedral of the Deep. Dropped by Knight Slayer Tsorig underneath the Smouldering Lake. Dropped by a Mimic in the Profaned Capital (near boss fog). Looted from a corpse in Archdragon peak, on the arch just after the first bonfire and before the boss fight. Dropped by Havel after defeating him in Archdragon Peak. Can be obtained by reaching rank 2 in the Watchdogs of Farron Covenant. Dropped by Cathedral Knights wielding the Hammer and Greatshield. From the Ringed City Streets bonfire, head through the shortcut until you get to the bridge with the dragon in the distance. This shield is under the bridge. Having played the game with a shields only build recently, I&apos;m disappointed with the damage output of the "ultra greatshields". They will happily munch much more stamina than other greatshields but the damage doesn&apos;t really match the extra consumption. Their insane weight and high strength requirements should be punishment enough for the extra stability which isn&apos;t really even necessary for PVE. 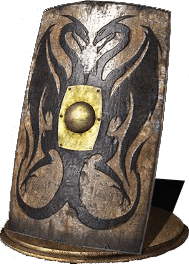 The Black Iron Greatshield seems like the ultimate greatshield, great defenses and stability for a relatively low weight and most importantly, it&apos;s easily available fairly early. Greatshield + Carthus Blood Ring + Caestus to spam the leaping Ghrus renders all PVE trivial. Seriously you can beat the game easily on any run with just these three items and whatever straight sword. also has anyone found Orma and Reevs yet? For those that haven&apos;t found it yet, you can get Havel Greatshield from Archdragon Peak, when you get to the bonfire next to The Nameless King just go outside to the area with all the snake dudes (not the way with the stone lizards) in one of the broken tower parts you&apos;ll find a walkway, follow it into the next bit, it&apos;ll be a small balcony with one stone lizard, there are some ladders on this balcony that leads up to the roof, on the roof you will find Havel Himself, defeat him and you&apos;ll get his shield and the Dragon Tooth Great Club.